When there is change it forces our mind and body to adapt. 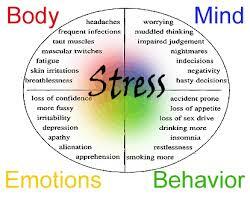 What we call stress is just the way our bodies change to meet the changes we are faced with every day. Essentially, stress is a survival mechanism. The problem is that when the changes to which we must adapt exceed our resources, then stress can become damaging (see the symptoms in the picture at the top of the page). The longer this is left unchecked the worse the damage. I work with my clients to craft an individualized stress management plan that helps the client learn skills and techniques to inoculate themselves against the damages of stress (thus creating resiliency) as well as finding ways to specifically manage and reduce specific life stressors. To learn more about stress management or to schedule a consultation, please click the “schedule session” button to the right or call 484-693-0582.